Have a small event coming up this summer? A summer fayre or fate at a local venue and looking for a Large pop up Gazebo to hire? This large gazebo is ideal for any small events, easy to use and great for any kind of use. 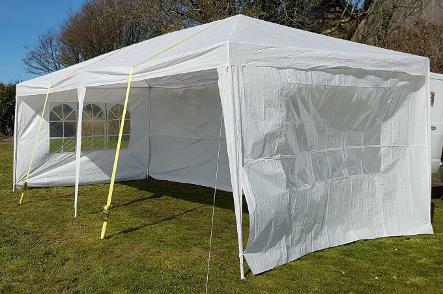 As well as all the fittings and hooking pegs which are provided with the gazebo, we provide heavy duty pegs for use on the guy ropes and 2 ratchet scraps to ensure a gust of wind won't lift the gazebo up. Can be used as pictured above or with 2x zip up front panels. All panels provided can be used on any side giving you maximum flexibility.